A simple GULP compiling and minifying LESS files to CSS using Visual Studio Task Runner Explorer. This example watches a folder containing LESS files and compiles them to CSS on any changes or when the project is built or cleaned. By doing this you can have a primary LESS file, and when this or any referenced by it through “@import” statements, compiling to a single CSS file. 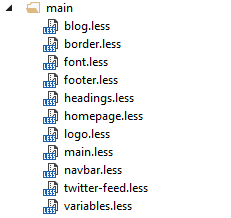 In this example, the primary LESS file is called “main.less”, it will be compiled to “main.css” and “main.min.css”.